Tin can succulents – recycling and re-using to make some of my favorite succulent containers from the humble and ordinary (and usually discarded) tin can. Succulents don’t mind small containers with only a tiny bit of soil – they don’t even mind being planted in cans even though the metal of tin cans can get hot in the sun. Recycled containers are all around us – use whatever rustic salvage you can from junk piles and trash – there are some gems in there! Burn the finish off food cans, dog food tins and any other metal container in a bonfire. Once the paint or other covering is burned off, take the can out of the fire and leave it to cool. Immersing it in a bucket of water will take off any soot, and you’re ready to start your tin can succulent planter. 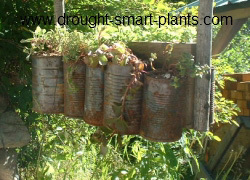 Choose several different sized tin cans, and arrange them to get an idea of where you will place them on your planter. I use a 1x6 or 2x6 lumber scrap, or you can attach them to a twig. Drill a drain hole or two in the bottom or the side near the bottom. Screw the cans onto the lumber, or drill holes in the side near the top and use wire to attach them to the twig. For a handle, use a wiggly twig or root handle, or a piece of twisted wire to hang them up. Put some succulent soil in the cans, fill with your choice of succulents – Sempervivum, Sedum or tender succulents, and place in a semi-shaded spot to display them. The full sun on the metal cans will cook the roots, so an area shaded from hot afternoon sun is best. 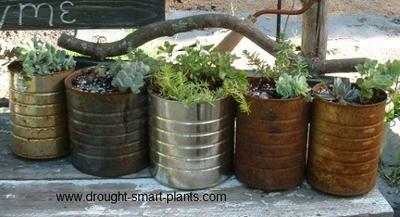 To store for the winter, it’s best to put your tin can planter on the ground and cover the base with leaves. Expect to replace your plants every year or so, as the amount of soil in the cans will be depleted and the plants will die back. Mix a small amount of worm castings with the soil, or sprinkle some on the top of each plant once or twice during the growing season. You can also water occasionally with compost tea. Enjoy your unique and funky containers for succulents! These would be so fun as a Christmas (or other holiday) centerpiece. I'm seeing it with pine cones and twigs in among the succulents. And maybe a flameless (battery operated) tea light or two.